Season Ticket Holders enjoy savings up to 45% off the door price for every Stampeders home game. Choose the payment schedule that works best for your budget with no interest payment plans. Manage your Season Tickets online with ease through your myStamps Account Manager. Never waste a ticket! Exchange unused or future game tickets for tickets to another game in the regular season. Enjoy up to 25% off merchandise, and 10% off on jerseys and collectibles at the Stamps Store and FanAttic locations across Calgary. 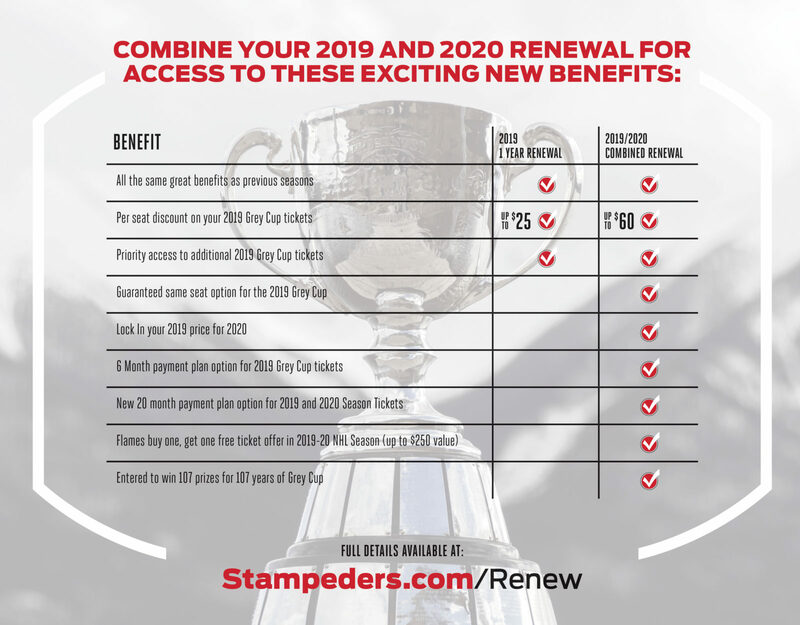 Get priority access to 2019 Grey Cup tickets in Calgary. Enjoy one complimentary ticket to the June 1, 2018 pre-season game for each Season Ticket you own. A $40 value! Take part in exclusive Stampeders Season Ticket Holder events. Take advantage of exclusive offers from the Calgary Flames, Calgary Hitmen and Calgary Roughnecks. Questions? Connect with a Season Ticket expert to give you all the information you require.